We headed north-east out of Boston on the Aurora today to the waters near Cape Anne. 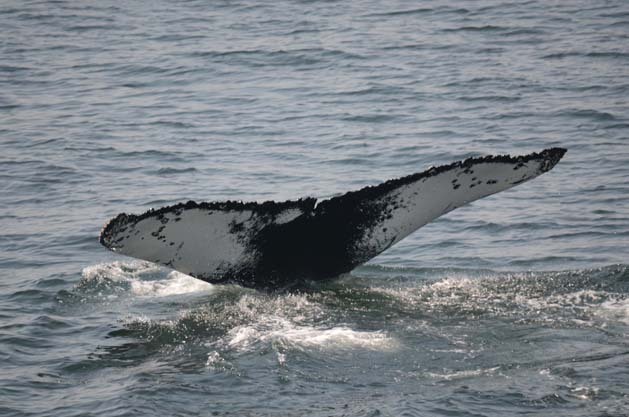 There we were able to get great looks at a humpback whale, Pinball. Pinball, who is a female humback born in 1989, was using the same low bubble clouds to feed that we’ve been seeing over the past few days—lunging below the surface out of sight, but leaving a cloud of bubbles at the surface. We also saw some lunge feeding minke whales in the distance. Overall the day was a great respite from the heat on land, and a perfect opportunity to see some close up whale behavior.